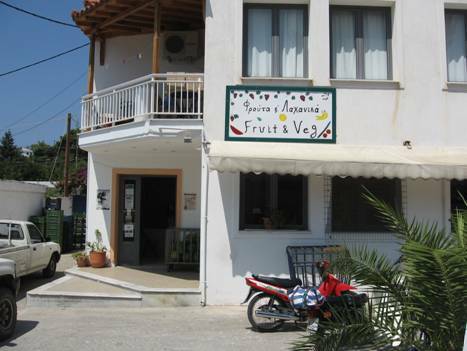 Our favorite spot to buy fresh fruit and vegetables in Alonnisos is a shop in Patitiri (see photo to your right) located a little over a kilometer from the harbor. It’s about two blocks up from the Pappou Market; just go past that store and at the first cross street turn left. Then proceed about a half a block and it’s on the left side of the street (coming from the Old Village it’s across the street and down from “The Doors” grocery market). This fruit/veggie shop is operated by a wonderful woman named Soula and her husband. They come to spend each summer working in Alonnisos and live the rest of the year in Thessaloniki. Soula’s store always has great selection of produce, including products you don’t find as often in Greece (e.g., broccoli, cauliflower). We are particularly fond of the peaches and nectarines they sell.